It is one of the biggest events on the Indian social calendar this year. The only trouble is, it is taking place in France, and journalists are strictly banned. It features 1,000 guests from all over the world, 20-page-thick silver-cased invitation cards and five days of events staged in some of the France's most famous settings. And, of course, there is Bollywood song and dance. This then is the mother of all weddings for the daughter of one of the wealthiest Asian men in the world. 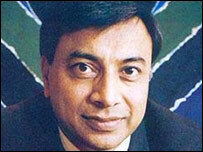 The host is London-based Indian-born steel tycoon Lakshmi Mittal. The bride is his daughter Vanisha. 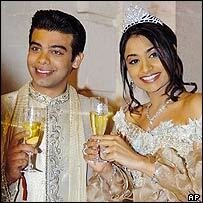 The bridegroom is Amit Bhatia, a Delhi-born investment banker, now based in London. Mr Mittal owns a steel company with an estimated worth of $6.4bn. Only last April he paid out nearly $127m for a London mansion, making it the most expensive house in the world. The wedding is expected to cost more than $55m - that includes expensive gifts for family and friends - according to accounts in Indian newspapers. The guests have been put up by the host in a five-star hotel in Paris. Mr Mittal has hired the 17th century Vaux le Vicomte, described as the "finest chateau and garden" in France, for the marriage of 23-year-old Vanisha, who has a degree from London's School of Oriental and African Studies, and her banker fiancé. The chateau was built for Nicolas Fouquet, King Louis XIV's finance minister. "There will be an Indian marriage party here on 22 June. We are smaller than Versailles but from the point of beauty we are number one, we think," a spokesman at the Vaux le Vicomte, some 55 km from Paris, is quoted as saying. The newspaper says the festivities will "light up Paris... and the gardens of Eiffel Tower have been cleared for the mother of all firework displays". The engagement ceremony took place on 20 June at the Palace of Versailles, once the home to Louis XIV, France's Sun King. There was a lavish dinner for the guests at the Jardin des Tuileries on the right bank in Paris. The highlight of the engagement ceremony was a cocktail party for the guests who were then taken through the palace. Mr Mittal and his wife, Usha, according to reports, even played themselves in an hour-long 'drama' which enacted the love story of Vanisha and 25-year-old Amit at a glittering function on the banks of the Seine. The domestic drama was a Bollywood production. The script was written by leading movie writer Javed Akhtar, set to music by music director Shankar Mahadevan and choreographed by dance director-turned filmmaker Farah Khan. At the Palace of Versailles, guests to the wedding were also regaled by can can girls, evoking the heydays of the Moulin Rouge, according to India's The Telegraph newspaper. The bridal trousseau has been designed by some of the top Indian designers, including Suneet Verma and Tarun Tahiliani. One of the top chefs from the eastern Indian city of Calcutta, where Mr Mittal was born, was flown to Paris to prepare Indian food for the guests. Munna Maharaj, Calcutta's top caterer-turned-restaurateur, has a reputation for rising to the challenge of a big event. According to one report, he once prepared more than 120 dishes for some 15,000 guests. The expensive wedding invitation card has also become the talk of the Indian media. The card contains romantic poems, including some written by a Mittal family member. A lavish feast fit for a king." "There is just a hint that the Mittals see themselves as maharajahs on a par with the ancient royal houses of Rajasthan..," is The Telegraph's comment. The Indian media is agog with 'leaked' and 'unofficial' reports from the wedding. 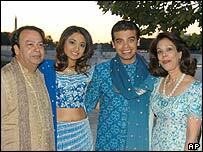 Mr Mittal had earlier issued a statement making it clear he would not be inviting the media to cover the wedding. 'Papa, Buy me the Eiffel,' headlined a report in Outlook, one of India's leading magazines, alluding to the extravagance in Paris. "The steel magnate summons all the romance of Paris to gift his daughter-and his guests-a fairytale wedding," the magazine said.